Cerebrovascular accidents, otherwise known as strokes, can create a long-lasting impact on a person’s life. Everything from how you go to the bathroom to eating breakfast has been changed by this major event. If you or someone you love has had a stroke, here are some things to be aware of and tips to make life easier when it’s time to go home. Stroke affects vision by reducing functions related to distance vision, peripheral awareness, and accommodation, which is the ability to switch focus when seeing an object move closer or further away quickly. Patients may also have double vision. Another possible visual deficit is homonymous hemianopsia, which is loss of vision on the same side of both eyes. This means half of the visual field is lost. People who have had a stroke may not be able to see objects in that part of their visual field and may be unaware of their visual deficits, which is a functional limitation and a safety hazard. Visual perceptual impairments also occur after a stroke. They include loss in the ability to scan, search, and attend. You may have slower eye movement and lose the ability to have gaze shifting. This can also impact function and safety. Marking things like pages inside books or corners in your home with colored markers, tape or flags can help make boundaries that orient you. Balance problems may affect stroke survivors’ ability to perform self-care activities by making you more at risk for falling. Constantly worrying about falling makes it difficult to concentrate on other aspects of the task at hand. You may find all your energy being used to stabilize your muscles due to balance issues and make simple tasks really draining and unsafe. Compensatory techniques you could learn are using a hemi-walker while dressing. You could learn one-handed shoe-tying and dressing. You can get a variety of adaptive equipment and alternatives for dressing including button hooks, Velcro fastenings, elastic waistbands, shoehorns, and splints with straps. You could use a long-handled sponge, a bath bench, soap on a rope, handheld shower heads and grab rails for showering. For shaving, you could also use an electric safety razor or a razor holder with a strap and aerosol can dispenser handles for your shaving cream can. There are lots of things you can find online that can help you be more independent. Decreased awareness of your affected arm when moving from one place to another can impact your safety. Your affected arm can be vulnerable to obstacles and hazards in the environment that may hit or injure it. You also may not be able stabilize yourself with the affected side. Sometimes you may think you are balanced when you are actually leaning away from the affected side because it is difficult to acknowledge that side of the body. This makes you at risk for falling. Complications that could arise from having a flaccid arm are being overstretched by muscles that very little tone. Also bones may move out of their sockets and lead to subluxation. Preventative strategies that could address these complications involve positioning and supporting the flaccid arm either with the unaffected arm or with devices like wedges, bolsters, pillows, towels, lapboards, tables, and splints. Alternating from sleeping on left side, to right side, to back can also help prevent complications. Information about your home environment is important for improving your function and independence when managing daily activities like cooking or using the bathroom. Some questions to consider are whether you have any stairs or steps to enter the house or any rooms. If so you may consider getting a ramp or chair lift if your stability is limited. How organized or messy is your home and are there any hazards like cords on the ground. Are there are any rugs that could destabilize you? Is there enough room in the hallways of your house for your walker and you to walk through? Having clear walking spaces makes it easier to get from room to room without falling. Other questions to think about are how high are the toilet, bed, couch, chair, and couch? How high are your cabinets and can you reach them? Also, where could you possibly need hand rails to be placed? Handrails near toilets, shower stalls and steps provide an extra support when shifting your weight and can aid in maintaining balance during transitional movements. These are all questions to consider when returning home after a stroke. Family members could be involved in the rehabilitation program by helping you follow through with treatment. They could learn dressing techniques and encourage you to practice. Making sure you don’t fall and supporting your affected side at night with pillows are also ways they can assure your safety. They could make sure the house is clean and organized so that you don’t lose balance. 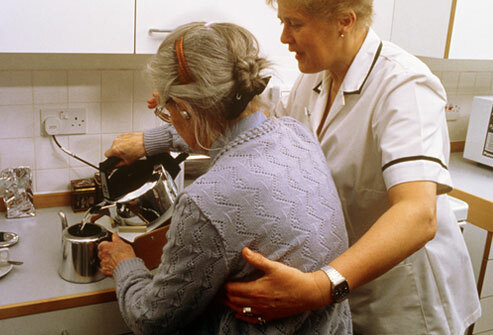 They can describe your routine and home setting to the rehabilitation professionals to give a clearer picture. In general, being patient and supportive and letting you try to do as much as you can on your own while watching for your safety are the best things your family can do to contribute to your recovery. Early, M. (Ed.). (2006). Physical dysfunction practice skills for the occupational therapy assistant. St. Louis, MO: Mosby Elsevier. This entry was posted in Neurological, Occupational Therapy, Uncategorized and tagged Adaptive Equipment, CVA, Home Modification, OT, Stroke. Bookmark the permalink.